The Enron scandal, revealed in October 2001, eventually led to the bankruptcy of the Enron Corporation, an American energy company based in Houston, Texas, and the dissolution of Arthur Andersen, which was one of the five largest audit and accountancy partnerships in the world. In addition to being the largest bankruptcy reorganization in American history at that time, Enron undoubtedly is the biggest audit Failure. Before its bankruptcy on December 2, 2001, Enron employed approximately 20,000 staff and was one of the world’s leading electricity, natural gas, communications, and pulp and paper companies, with claimed revenues of nearly $101 billion in 2000. Fortune named Enron “America’s Most Innovative Company” for six consecutive years. Enron was formed in 1985 by Kenneth Lay after merging Houston Natural Gas and InterNorth. Several years later, when Jeffrey Skilling was hired, he developed a staff of executives that, through the use of accounting loopholes, special purpose entities, and poor financial reporting, were able to hide billions in debt from failed deals and projects. Chief Financial Officer Andrew Fastow and other executives were able to mislead Enron’s board of directors and audit committee of high-risk accounting issues as well as pressure Andersen to ignore the issues. Enron’s stock price, which hit a high of US$90 per share in mid-2000, caused shareholders to lose nearly $11 billion when it plummeted to less than $1 by the end of November 2001. The U.S. Securities and Exchange Commission (SEC) began an investigation, and Dynegy offered to purchase the company at a fire sale price. 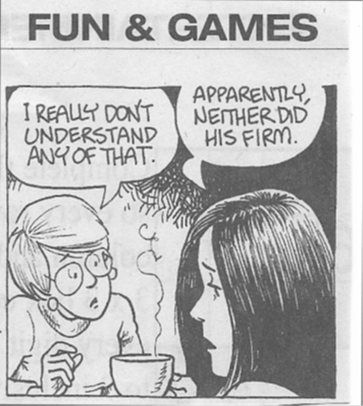 When the deal fell through, Enron filed for bankruptcy on December 2, 2001 under Chapter 11 of the United States Bankruptcy Code, and with assets of $63.4 billion, it was the largest corporate bankruptcy in U.S. history until WorldCom’s 2002 bankruptcy. As a consequence of the scandal, new regulations and legislation were enacted to expand the reliability of financial reporting for public companies. Kenneth Lay founded Enron in 1985 through the merger of Houston Natural Gas and InterNorth, two natural gas pipeline companies. In the early 1990s, he helped to initiate the selling of electricity at market prices and, soon after, the United States Congress passed legislation deregulating the sale of natural gas. The resulting markets made it possible for traders such as Enron to sell energy at higher prices, allowing them to thrive. After producers and local governments decried the resultant price volatility and pushed for increased regulation, strong lobbying on the part of Enron and others, was able to keep the free market system in place. By 1992, Enron was the largest merchant of natural gas in North America, and the gas trading business became the second largest contributor to Enron’s net income, with earnings before interest and taxes of $122 million. The creation of the online trading model, Enron Online, in November 1999 enabled the company to further develop and extend its abilities to negotiate and manage its trading business. In an attempt to achieve further growth, Enron pursued a diversification strategy. By 2001, Enron had become a conglomerate that both owned and operated gas pipelines, pulp and paper plants, broadband assets, electricity plants, and water plants internationally. The corporation also traded in financial markets for the same types of products and services. As a result, Enron’s stock rose from the start of the 1990s until year-end 1998 by 311% percent, a significant increase over the rate of growth in the Standard & Poor 500 index. The stock increased by 56% in 1999 and a further 87% in 2000, compared to a 20% increase and a 10% decline for the index during the same years. By December 31, 2000, Enron’s stock was priced at $83.13 and its market capitalization exceeded $60 billion, 70 times earnings and six times book value, an indication of the stock market’s high expectations about its future prospects. Enron’s non transparent financial statements did not clearly detail its operations and finances with shareholders and analysts. In addition, its complex business model stretched the limits of accounting, requiring that the company use accounting limitations to manage earnings and modify the balance sheet to portray a favorable depiction of its performance. 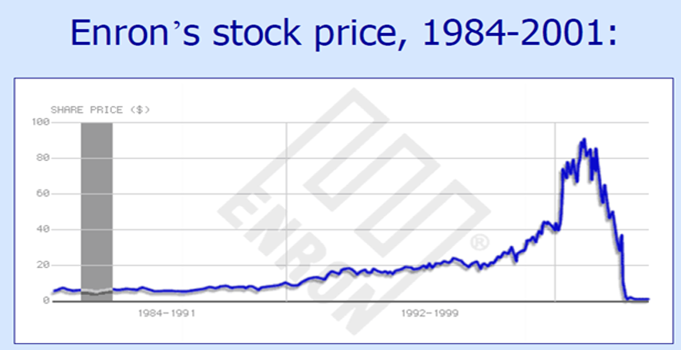 According to McLean , “The Enron scandal grew out of a steady accumulation of habits and values and actions that began years before and finally spiraled out of control.” From late 1997 until its collapse, the primary motivations for Enron’s accounting and financial transactions seem to have been to keep reported income and reported cash flow up, asset values inflated, and liabilities off the books. The combination of these issues later led to the bankruptcy of the company, and the majority of them were perpetuated by the indirect knowledge or direct actions of Lay, Jeffrey Skilling, Andrew Fastow, and other executives. Skilling, constantly focused on meeting Wall Street expectations, pushed for the use of mark-to-market accounting and pressured Enron executives to find new ways to hide its debt. Fastow and other executives, “…created off-balance-sheet vehicles, complex financing structures, and deals so bewildering that few people can understand them even now”. 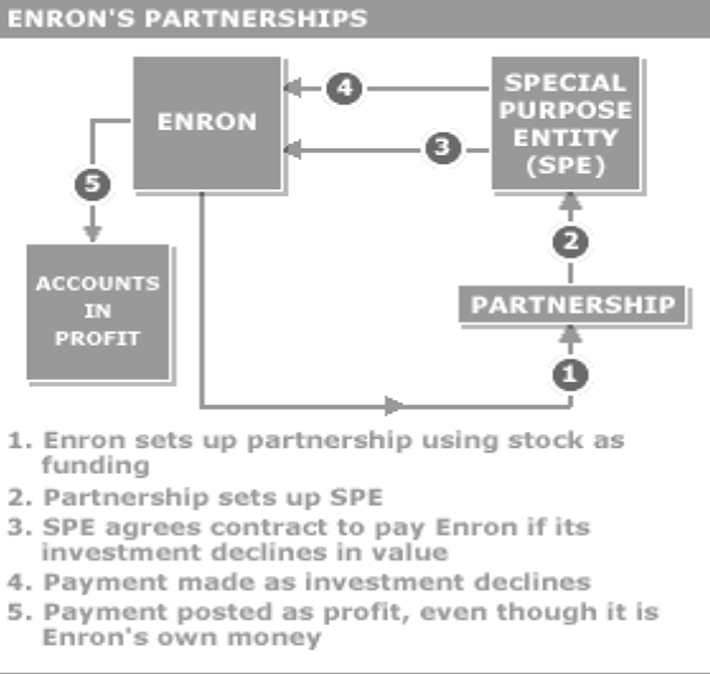 Enron used special purpose entities—limited partnerships or companies created to fulfill a temporary or specific purpose—to fund or manage risks associated with specific assets. The company elected to disclose minimal details on its use of special purpose entities. These shell firms were created by a sponsor, but funded by independent investors and debt financing. By 2001, Enron had used hundreds of special purpose entities to hide its debt. The special purpose entities were used for more than just circumventing accounting conventions. As a result of one violation, Enron’s balance sheet understated its liabilities and overstated its equity, and its earnings were overstated. Enron disclosed to its shareholders that it had hedged downside risk in its own illiquid investments using special purpose entities. However, the investors were oblivious to the fact that the special purpose entities were actually using the company’s own stock and financial guarantees to finance these hedges. This setup prevented Enron from being protected from the downside risk. Although trading firms such as Goldman Sachs used the conventional “agent model” for reporting revenue (where only the trading or brokerage fee would be reported as revenue), Enron instead elected to report the entire value of each of its trades as revenue. This helped Enron post higher revenues as to stay competitive in the market. Between 1996 to 2000, Enron’s revenues increased by more than 750%, rising from $13.3 billion in 1996 to $100.8 billion in 2000. This extensive expansion of 65% per year was unprecedented in any industry, including the energy industry which typically considered growth of 2–3% per year to be respectable. In each time period, the company listed actual costs of supplying the gas and actual revenues received from selling it. However, Enron adopted mark-to-market accounting, citing that it would reflect “… true economic value.” Enron became the first non-financial company to use the method to account for its complex long-term contracts. Mark-to-market accounting requires that once a long-term contract was signed, income was estimated as the present value of net future cash flows. Due to the large discrepancies of attempting to match profits and cash, investors were typically given false or misleading reports. For one contract, in July 2000, Enron and Blockbuster Video signed a 20-year agreement to introduce on-demand entertainment to various U.S. cities by year-end. When the network failed to work, Blockbuster pulled out of the contract. Enron continued to recognize future profits, even though the deal resulted in a loss. Enron made a habit of booking costs of cancelled projects as assets, with the rationale that no official letter had stated that the project was cancelled. This method was known as “the snowball”, and although it was initially dictated that snowballs stay under $90 million, it was later extended to $200 million. In 1998, when analysts were given a tour of the Enron Energy Services office, they were impressed with how the employees were working so vigorously. In reality, Skilling had moved other employees to the office from other departments (instructing them to pretend to work hard) to create the appearance that the division was bigger than it was. This ruse was used several times to fool analysts about the progress of different areas of Enron to help improve the stock price. Enron was estimated to have about $23 billion in liabilities from both debt outstanding and guaranteed loans. Citigroup and JP Morgan Chase in particular appeared to have significant amounts to lose with Enron’s fall. Additionally, many of Enron’s major assets were pledged to lenders in order to secure loans, throwing into doubt what if anything unsecured creditors and eventually stockholders might receive in bankruptcy proceedings. Is Sri Lanka the new economic miracle in waiting?